Leonardo’s study of the landscape under different atmospheric and weather conditions generated important observations and conclusions, which he recorded in his notebooks and subsequently implemented in his paintings. In the Madonna, Child, St. Anne and a Lamb, high mountain peaks loom out of a blue atmospheric haze and disappear into a white, misty distance, forming a very high horizon that rises even above the head of St. Anne. The monumental, mountainous landscape against which the holy family group is situated extends across the entire width of the picture and takes up approximately one third of the picture space. It is a fitting metaphor for the eternal and infinite cycle of nature and the mysterious, creative power of natural forces. The idea that all natural phenomena as inextricably linked, each giving rise to the other, is perfectly echoed in the theme of this painting, and echoed in the tightly-knit family group of the Virgin and her mother and child with the lamb situated in the foreground. I say that the blueness we see in the atmosphere is not intrinsic colour, but is caused by warm vapour evaporated in minute and insensible atoms on which the solar rays fall, rendering them luminous against the infinite darkness of the fiery sphere which lies beyond and includes it. 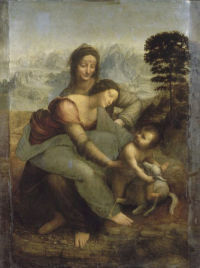 This painting is the culmination of a series of studies and versions of the same Holy family theme in drawings and cartoons by Leonardo. The composition appears to be similar to that of a cartoon (now lost but known through verbal descriptions) executed in 1501 in preparation for an altarpiece for the Giacomini Tebalducci Chapel in the church of Santissima Annunziata, Florence, which was exhibited to the public in the same church to great acclaim. The Madonna and Child with St. Anne and St. John the Baptist, (also known as the Burlington Cartoon, National Gallery, London) represents the same family group in a variant of the same composition in what appears to be an unused cartoon drawing.